Legend of Grimrock 2 will make use of dramatically shortened skill trees in order to encourage greater diversity among the players in your party. Legend of Grimrock had kind of an oddball skill system. Individual skills could be advanced all the way to level 50 but required multiple skill points to gain a single benefit. The net result was forced specialization: To achieve the highest levels of power in a particular skill, you had to focus on that skill to the exclusion of most others. That's not what developer Almost Human was after, and so the studio has changed things up rather dramatically for the sequel. "In LoG2 when you gain a level, you are rewarded with only one skillpoint. To counterbalance this the skill trees are much shorter. This way, every skillpoint spent matters now and there aren't any intermediate skill levels," the studio explained in a new blog post. "In fact, most skills are only 1-3 levels deep and there are many on/off kind of perks that you can buy." As an example, the "Armor" skill as it currently stands has just three levels: The first allows characters to wear light armor without penalty, the second does the same for heavy armor and the third and final level reduces the weight of all equipped armor by 50 percent. 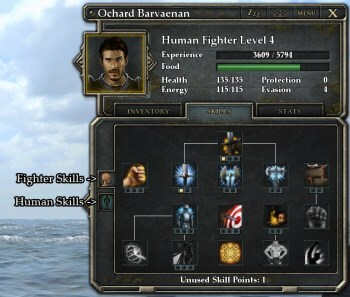 There's also an "Athletics" skill that can be increased an unlimited number of times, boosting strength by one point with each new level, and a unique, morale-boosting "Leadership" skill that can be acquired by anyone - but only one character in the party may have it. Some of the perks will have skill prerequisites, and each class will have its own skill tree, although some will be shared; there will also be a separate "mini skill tree" based on race. Almost Human says the new system "unifies traditional skills, perks and racial traits," which will hopefully both simplify and diversify character development.